Looks can be deceiving. Sometimes a smile doesn’t guarantee the person giving it is happy. Sometimes a frown or grimace is sarcastic. Sometimes, as is the case with certain disturbing horror story antagonists, sound design including cheerful music can exacerbate a tense situation rather than diffuse it. When it comes to being musically straightforward, Swedish indie / jangle pop band, Alpaca Sports, seems like a consistent, as opposed to deceptive bunch. Pick out an individual track from pretty much anywhere in the band’s growing discography and it’s virtually certain to be an upbeat tune that inspires thoughts of beach parties, sunny days, rainbows, sparkles, and every long-playing friendship montage with cheerful music synced behind it. This proposed scenario isn’t completely unlikely with the band’s newest long play offering, From Paris with Love, which emerged at the end of last week via Elefant Records. However, at the same time, that doesn’t mean listening merely requires one smiles and closes their eyes for a cruise controlled listening experience. This sophomore outing, while filled to the brim with instrumental and lyrical staples of carefree and easily approachable pop, isn’t just about presenting emotion at face value. A little of the emotionally unexpected helps From Paris with Love to deepen what might look from a distance, like an album stuck on one sentiment setting. Parts of its collection ring truer to the idea of, while perhaps not outright deception, emotional layering and that’s where From Paris with Love finds the majority of its growth from Alpaca Sports’ debut to now. Once Alpaca Sports get things underway, the music hits the ears much the same as the scent of one’s favorite drink or, perhaps a favorite summer blooming flower, hits the nose. The initial burst of uptempo snare rolls; clean, syncopated, and irresistibly catchy rhythm and lead guitar; tonally perfect digital strings, and unison doubling on the melody by guitar and bell-like keys are all a straightforward, recognizable combination of sound stylizing in which it’s easy to delight and onto which it’s easy to grab. The instantaneousness of desirable recognition is akin to feeling a cool burst from an air-conditioned room after coming indoors from an oppressive summer heat. Such reflexes sound like things worth immediate embrace and musically that’s a fair assessment. Lyrically though, Alpaca Sports are out to make people turn their heads and ask for the question again. The above lyrics don’t begin the opening song but the theme isn’t hard to glean from just this verse: A person who’s affection has gone rejected and who believes they aren’t good enough for the one they desire. Yet, as the song continues, this person “always come[s] back for more.” In a single word: desperation. This is hardly a state of being that one would associate with major key tones, hummable hooks, and guitar tones that promote the visual of a never-ending beach party; to say nothing of the fact that most people don’t embrace feeling desperate with a forward facing reflection of a happy presentation. And while the sonic cheeriness of the album continues quite fluidly and maintains undeniable instrumental cohesion as it goes on, it’s interesting to observe how a song like “Summer Days,” which, when reviewed alone, seems like a lovingly devoted, and fun but sincere song about a buzzing romance in summer’s throes. However, heard in close proximity to the opener and then followed by second single, “Nobody Cares But Me,” seems to only help emphasize themes of excessive infatuation (I just need you / And summer days in the sun / No one loves you like I do / Loves you like I do) in the face of even more rejection and regret (In my dreams you’re still waiting for me With a tear in your eye But I know it’s already too late And nobody cares but me). Have these Alpaca Sports started a stunning upset yet? Jokes aside, it’s fascinating that with each new track, From Paris with Love seems to want to give listening ears a chance to be again taken in by joy and easy-going reveries with more optimistic chord progressions and fanciful instrumentation leading the way into each song and resetting away from any prior mention of heartbreak of negative outcomes. “Eiffiel Tower,” which changes things up merely from the move of Jonsson out of the vocal spotlight and swapping in of Amanda Åkerman on the mic, by default gains a lighter tone from Mitnik’s delicate and enunciatively gentle voice. Look no further than the way Åkerman’s voice delivers lines, the bouncy, show tune style syncopation of the piano motif, and the beloved cliche of flowing melodica meant to inspire thoughts of Parisian afternoons and the song is like a free pass for a few minutes daydream travel to France. The song doesn’t start and end at the surface though and just like those before, the central emotion tied to this seemingly sunny affair is one of despondence among reminiscence. There’s not much in the way of respite from Alpaca Sports’ mostly fruitless pursuit of respective true loves in the album’s dozen songs. Though the through line of sadness seemed at first like an unintended trick of connective context between storylines that could or perhaps should be heard independent of one another, if there’s one thing that’s proven to affect records enough to take them from average to great, it’s track placement and larger context. If a band goes to release a full length album, that means the songs are meant to be affected by experiential proximity to one another. That said, once it becomes clear the source inspiration fueling this sophomore outing is that of lost love, it’s easy to let go of the confused shock and return before the album ends, to finding pleasantry in the band’s presentation of its missed connection. There’s enough variety under the umbrella of indie pop that a band like Alpaca Sports needn’t be confined to one musical setup and indeed the group doesn’t do this, as the guitar front jangle numbers are off-set with contrast that comes in the form of reverb laden, polished, acoustic guitar and more restrained melodies that, although slower in tempo, aren’t doomed to completely sadness. Instead, the result takes Alpaca Sports to quieter folk music learning territory, not unlike quieter ballads of singer-songwriters. These stops, on tracks like “Birds” and “Baby, What Can I Say?” evoke a tonal cleanliness that aligns with the band’s established preference for bright sounds but deviates enough for cuts like these not to elicit an instant dance party like many of the others. The album descends toward its ending returning to the defaults of upbeat jangle pop on “Without You” and a slightly slower swinging jangle number for “Saddest Girl in the World” but it’s the finale in “Luxemborg Gardens” that really stands out, despite ending things on a note of musical reservation and dejected extremity. Beyond being the longest track on the album at almost five and a half minutes, this track again has Jonsson off the vocal mic and then, also adds in a layer of sounds like sustained soft synth tones and chirping birds. The lyrics are the most serious and foreboding of all 12 sets; almost at times, sounding like a person pleading for their (ex?) lover not to abandon all sense of hope or optimism in life, in the face of a currently disconnected relationship (Look into my eyes / Give me something real / Life in misery / makes no sense to me / If my arms were wings I would fly away / To a better place / To that sunny day). The song is crisp and clear but distinctly separate from the pop-oriented space in which each of these love songs has previously dwelled; offering a notably ambient framework around its downtrodden protagonist. The song begins and ends the same way, with bookends of happily chirping birds and warm, lasting synth tones. 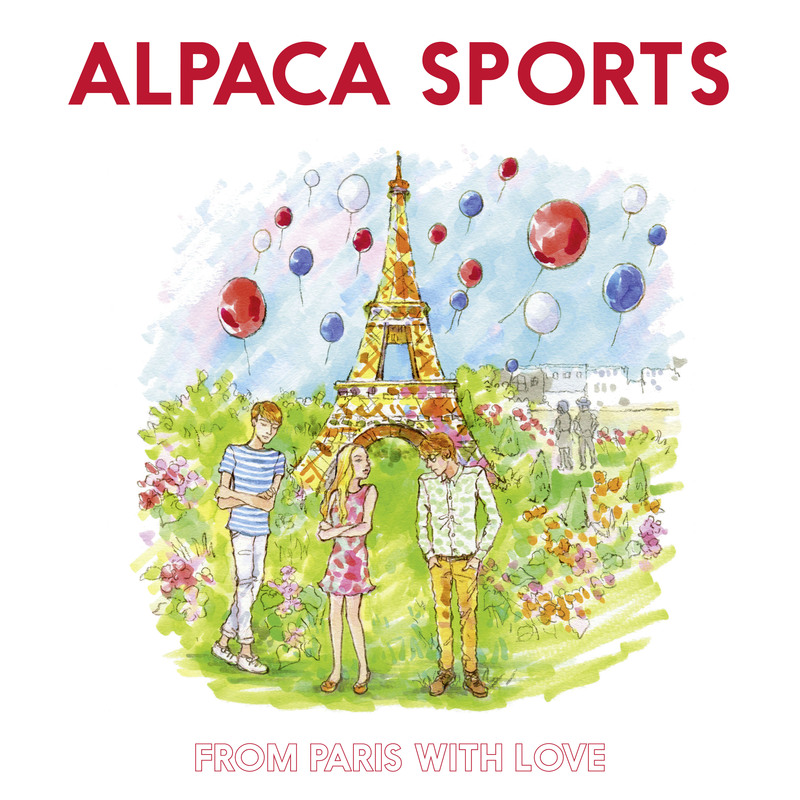 While this sonic premise is a peaceful one, after all is said and done, From Paris with Love makes it clear that Alpaca Sports wanted to show it wasn’t all about sunshine and rainbows every second of every day – even if that’s the kind of musicality this group best resonates with and enjoys writing. A detailed exploration of the album revealed its often distraught state of being but outside of such a precise and unwavering listen, there’s no reason Alpaca Sports’ newest record can’t still bring cheer to the background of its chosen setting by way of its instrumental and rhythmic foundation. Syncopation drives Alpaca Sports’ arrangements in a memorable and addictive direction, with chosen sounds always kept light over heavy (though the occasional punctuation of well-mixed in bass provides an ideal aural balance.) The band has more than proven its emotional rage with this outing and perhaps even more impressively, shown that the saddest of stories can be dressed in the most welcoming of musical packaging and that packaging can be enough to let listeners’ minds drift to the most pleasant of places and bring on the most uplifted of moods. From Paris with Love is available now via Elefant Records. Find it on iTunes,Google Play, and Amazon. Note: A previous version of this review listed Lisle Mitnik as the vocalist on “Eiffel Tower.” The singer is Amanda Åkerman.